If you were to design a new brand of plant you probably wouldn’t create one whose flowers lasted for only a day and you certainly wouldn’t draw attention to its brief life in its name. 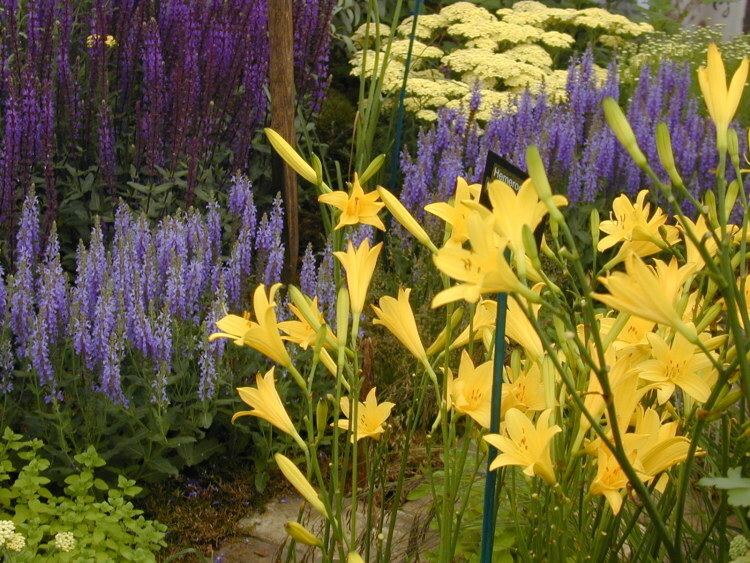 Yet daylilies (Hemerocallis) are just that: lily-like flowers that last just a few hours. Despite this handicap the genus is a stalwart of the herbaceous border in Britain and the best-selling perennial plant in North America. Clearly, this is a plant with more to offer than mere staying power. Although the flowers are ephemeral they are exceptionally beautiful. 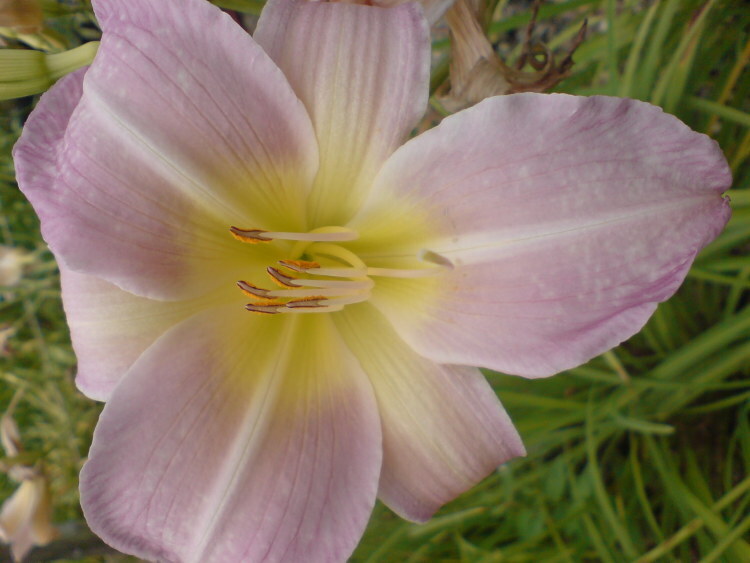 The name Hemerocallis is derived from the Greek words for ‘day’ and ‘beauty’. 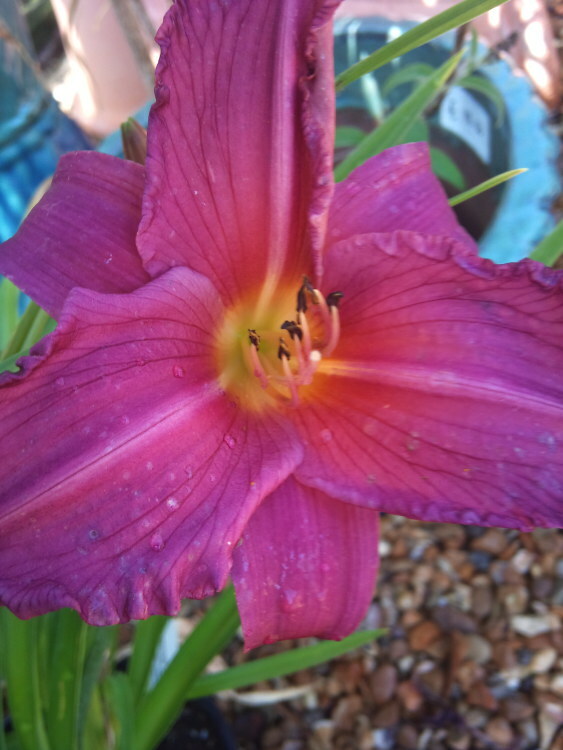 Fortunately the plant produces dozens of stems that contain several flowers so that, although each individual flower is short lived, daylilies produce flowers for weeks on end. Many are scented and the colour range encompasses the entire spectrum other than blue. One of the great attractions the plant holds for busy gardeners is that they are so easy to grow, thriving in sun or partial shade in any soil. Few plants that demand such little effort give such great results. Even the most neglectful gardener is rewarded with an impressive display of colour and scent. Plant breeders have produced a mind-boggling diversity of daylilies with flowers of every hue, often with two or three contrasting colours on the same flower. The range of flower shapes is even more complex. There are hybrids with circular, triangular, trumpet, star and spider-shaped flowers with crimped, ruffled and twisted petals. These hybrids are the Vivienne Westwood and Grayson Perry of the plant world. In the USA breeding daylilies is almost a competitive sport and the American Hemerocallis Society lists nearly 75,000 cultivars, each one seemingly more extravagant than the next. The names of the plants are often as exuberant as the flowers. Plants with monikers such as Hemerocallis ‘Memphis Insomniac’, H. ‘Free Hugs’ and the bizarre ‘H. ‘Bumfuzzled’ have not yet made it to Britain, where the RHS lists a modest 3,450 cultivars available from specialist nurseries. The names of British hybrids may be more restrained but the flowers are often no less extravagant than those of their American cousins. The wild forms of Hemerocallis have much more dainty that the flamboyant hybrids. The first to flower, H. lilioasphodelus, has slender stems about 75cm tall and clear-yellow lilly-shaped flowers. Its flowers open late in the day and don’t start to pump out its perfume until the early evening, making it a perfect for a garden that is mainly enjoyed after a hard day at work. H. fulva is a vigorous and free flowering species that has been grown in Europe since the sixteenth century. The striking orange-red flowers have an apricot-coloured line down the centre of each petal. In rich soil the flower stems can reach 1.2m tall; in poor dry soil half that height. As its name suggest, H. altissima is the tallest of the daylillies, measuring 2m heigh. Grow it for its delicious honey scent that is strongest on warm summer evenings. The species are widely distributed, from the Caucasus mountains and southeast Russia to the Himalaya and throughout China, Taiwan, Japan and Korea, growing mostly in meadows and grasslands. The species and the hybrids that most resemble them are suitable for relaxed, informal plantings amongst grasses and similar perennials or planted in the long grass of meadows. Their linear leaves mingle well with the stems of grasses. Hybrids and cultivars have been classified by Hemerocallis aficionados into very precise groups depending on their flower shape. Only addicts get obsessed by these distinctions: what most gardeners are interested in is the colour and size of the flower and how well the plant performs in the garden. Daylilies with flowers of a single colour are the easiest to place alongside other plants in borders and mixed plantings. They are often easier on the eye than multi-coloured forms. 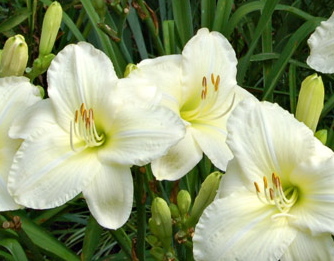 In my garden the daylily with the whitest flowers is H. ‘Gentle Shepherd’. It grows to about 75cm tall and looks at its best towards dusk when the flowers seem to glow in the half-light. H. ‘Joan Senior has creamy white flowers with slightly ruffled petals. Pink flowers often have a muddy tone in the colour but both H. ‘Catherine Woodberry’ and H. ‘Stoke Poges’ are a good, clean pink. ‘Stoke Poges has a band of dark pink at the base of each petal. If you are looking for stronger colours, consider the deep-burgundy, almost black, flowers of H. ‘American Revolution’ The edges of the petals develop a narrow gold lip that intensifies the darkness of the flower. It looks good planted amongst the exotic foliage of cannas and bananas and with hot colours of Geums and Crocosmias. Even darker and moodier, like its namesake, is H. ‘Bela Lugosi’. The flowers are large (often 15cm wide), dark and scented. The plant is only 70cm tall but it makes a dramatic statement from mid-July onwards. Most of the modern hybrids have bi-coloured or tri-coloured flowers. In the 1950s H. ‘Frans Hals’ appeared and sparked a renewed interest in Hemerocallis breeding. It has three yellow petals and three orange petals. From a distance the overall effect is a dusty-orange flower; close-up it looks bizarre. One of the most multi-coloured forms is ‘H. Moonlight Masquerade’ which has ivory-white petals that are stained wine red at the base. The same colour combination is found on H. ‘Open my Eyes’ but here the dark staining is also on the ruffled edge of three of the petals. At 14cm wide the flowers are quite an eyeful. Multi-coloured flowers are not for the faint-hearted. Use them either in singly to make a striking effect or in groups as part of a wild and uninhibited planting scheme. Its easy to become seduced by glamorous flowers but remember that plants with large, showy flowers tend not to be very prolific and that while, close up, a flower might be dazzling from a distance its colours will merge into one. If you want to give your daylilies a good start prepare the site by digging-in plenty of organic matter into the soil before you plant them. Daylilies will grow anywhere but will perform better in fertile, moist soils so mulch them with compost each autumn. Hybrids with large flowers are likely to need more feeding that those with small flowers. Regular deadheading during the flowering season is necessary to keep the plant looking clean. After a few years clumps may become congested and produce fewer flowers. Dig the plant up, split it into pieces no more than 20cm wide and replant immediately. Unlike most plant, daylilies can be split at any time of the year as long as the ground is not frozen. Daylilies have a midge, the Hemerocallis Gall Midge, that lays it eggs in buds early in the year. When the eggs hatch the larvae eat and destroy the flower. You can recognise the affected buds by their fat, rounded shape. Pick the off and destroy them. Late-flowering varieties do not suffer from the midge. The Chinese have been eating daylilies for centuries. Dried buds are sold in supermarkets throughout Asia under names such as Lilybud and Golden Needles to add to soups and stews. In the West, we have been slow to eat them but they do occasionally appear on the menus of adventurous chefs. Their short shelf-life means you are unlikely to find them in your local supermarket or even at a farmers’ market. If you want to try them, pick your own and eat them immediately. Buds should be picked before they begin to show the colour of the flower. I was offered buds of H. fulva sauteed in olive oil on the promise that they tasted like asparagus. They don’t but they do have a fresh, slighty peppery taste. Buds can also been steamed or stir-fried with other vegetables or eaten raw in salads. Later in the season the flowers can be added to salads, where they bring a lot of colour but not a lot of taste, or stuffed like courgette flowers. If you are a more accomplished cook than me, you could try frying fully-opened flowers in a tempura batter. Some Asian recipe books also have suggestions for using the young, fleshy roots, but if you want to keep you garden looking good its probably better to just graze on the occasional bud or flower.